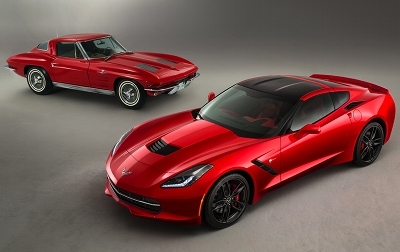 Old Car Memories > New Cars > 2014 Chevrolet Corvette Stingray – the New 1970s Trans Am? With the commencement of a brand new year and the announcements and fanfare just starting for some of the new 2014 models that will be hitting the new car showrooms as early as this spring and summer (while most will arrive in the fall). The North American International Auto Show (in Detroit) which opened two weeks ago, was the first glimpse for U.S. buyers of the hottest 2013 model year cars. As you can guess from the highlights of the show it appears 2014 will have its surprises and unfortunately its letdowns. The biggest of which is the 800-lb gorilla in the room of the rapidly rising Corporate Average Fuel Economy (CAFE) standards. Overall engine displacement is now beginning to fall due to CAFE. And cars with standard or optional V8s or V6s in the past are now losing 2 cylinders on the average. When Ford introduced at this year’s Detroit show the new and (very large) Atlas pickup truck concept which is a glimpse of the next generation F-150 pickup truck, didn’t have a V8 under the hood, instead in its place was the EcoBoost (turbocharged) 3.5 liter V6 which is available in its current F150 pickup. If this had been last year or any year in last twenty, this concept truck would have had a least a 5.4 liter V8 under the hood. Not only is this hulk of truck concept being showcased with a turbo charged V6 but Ford used lighter metals to lower weight in order to further increase fuel efficiency. And if that doesn’t convince you that the auto industry due to the tightening of the government mandated CAFE standards will be entering into a new dark age, even Ford is now admitting that the EcoBoost V6 in the future F-150 may shrink to only 3.0 liters of displacement. Even in the darkest days of the late-1970s and the early-1980s when engines saw massive displacement drops due to the implementation of the first wave of CAFE standards, no one could have ever imagined a full-size pickup weighing more than two tons with a motor of only 3.0 liters. Indeed dark times are ahead. Back in the mid-to-late 1970s, every automaker had abandoned large displacement V8s. Even the Corvette starting in 1975, lost its optional big-block 454 CID (7.4 liter) V8 and was stuck with only a 350 CID (5.7 liter) V8 – the Corvette had reached legendary status in the mid to late-1960s with its big-block 427 CID V8 option (which came in different horsepower flavors). By 1975, Chevrolet was retreating but Pontiac didn’t seem to care about the situation, it ignored the EPA’s CAFE ratings the same way Tony Soprano used to ignore his nagging wife Carmela. It offered a 455 CID (7.5 liter) V8 in the 1975 and 1976 Trans Am. And when GM brass stepped in and forced Pontiac to cancel 455 CID production. Pontiac shrugged its shoulders and merely hopped up its 400 CID (6.6 liter) V8 with some performance parts to come up with the 200 & 220 horsepower 1977-1979 W72 400 V8 also known as the "6.6 T/A" engine which saw duty in the 1977-1979 Pontiac Trans Am and Firebird Formula (the W72 was also standard on the limited production 1977 Pontiac Can Am). And this was back in the day when most performance cars produced well under 200 horsepower. And for the naysayers this was when the best that Ford could offer was a declawed 134 to 140 horsepower 5.0 liter V8. It was fair to say that the W72 400 was the hottest American performance engine in the late-1970s. Even the Corvette’s performance oriented L82 350 V8 was trumped by the power output of the W72. NHRA saw the 200 & 220 horsepower rating of the W72 400 V8 as a big joke, it rated the W72 at the more accurate 260 horsepower. No other American car put out that kind of horsepower output in the late 1970s. Unfortunately Pontiac had its wings clipped and GM forced the cancellation of its 400 V8 due to CAFE. Even so Pontiac with the W72 equipped 1979 Trans Am will always be remembered as the last of the large displacement muscle cars. It was the last one standing from the original large displacement muscle car era. Why is the story of how a now defunct automaker and one of its models which last saw production back in 2002 important? Simple, because it appears history is about ready to repeat itself. With CAFE going way up in the next few years all the automakers are running for cover. Displacement is shrinking. Pontiac is long gone and so is the Trans Am, neither will ever return again. They are vestiges of a bygone era. However history does repeat itself and in ways you don’t expect. At the festivities in Detroit in the last two weeks, the hoopla has been about the all-new 2014 Chevrolet Corvette Stingray or what is commonly referred to as the "C7" (which is short for 7th generation Corvette). And yes you did read it right, the "Stingray" nameplate after being gone for four decades has returned. It’s ironic that the Corvette which during the 1970s got trumped by the Trans Am in terms of performance would for 2014 take on its former competitor’s nonconformist attitude and rebel against the auto industry’s current run for the hills approach due to the upcoming CAFE ratings. Even BMW is dropping displacement across the board due to CAFE. However Chevrolet isn’t even breaking a sweat just like the Pontiac back in the 1970s. If any other automaker would be releasing a new 2-seat sports car for 2014, there would be a drop in displacement and certainly the infusion of at least 4 valves per cylinder and dual overhead cams, right? In the Corvette’s case, Chevrolet answers with a big "No". Just like the original Chevrolet small-block V8 that was released in 1955, the Corvette’s all-new fifth generation small-block LT1 (6.2 liter) V8 uses the tried and true pushrod design with only 2-valves per cylinder. As the old saying goes "if it ain’t broke don’t fix it", and Chevrolet has certainly taken this to heart. What Chevrolet’s detractors fail to see with this new V8, is that due to its pushrod design it’s ultra sturdy and very cost effective since it doesn’t have the extra parts of a dual overhead cam 4-valve per cylinder engine. However best of all it has a more compact size due to the pushrod design which really allows the new C7 to have such a low hood height in the front for superior aerodynamics and doesn’t take up too much space between the front wheels. The LT1 name is no stranger to Corvette fans, the first iteration was the 255 (net) to 370 (gross) horsepower small-block 1970-1972 LT-1 350 V8 which was an optional Corvette engine at the time. The small-block LT1 350 V8 then returned again as the Corvette’s standard engine from 1992 to 1996 producing 300 net horsepower. 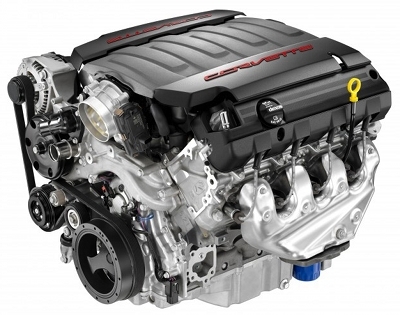 And now the LT1 will debut the new fifth generation Chevrolet/GM small-block V8 architecture. It is assured the fifth generation V8 will eventually make its way into other Chevrolet models such as the Camaro and full-size truck lineup. However don’t let the LT1’s pushrod design fool you into thinking this isn’t a state-of-the-art motor. The LT1 is one of the most technologically advanced V8s in the world. Everything from its ultra light aluminum block, Active Fuel Management (AFM) system which deactivates 4 cylinders when they are not needed for maximum fuel efficiency, free-flow aluminum heads, a Variable Value Timing (VVT) cam, and a high-tech direct injection system. All of these items help the C7 boast highway mpg from the current C6 equipped with the LS3 6.2 liter V8 (which has a highway figure of 26 mpg) to a whopping 30 mpg. The new LT1 may have the same bore as the LS3 of 4.065 inches and stroke of 3.62 inches however that’s where the similarities end. GM started with a fresh sheet of paper when designing the LT1, less than a handful of parts are interchangeable with the current LS3. The LS3 is a tough act to follow, after-all it produced a very respectable 430 horsepower and 424 lb-ft of torque (with the optional dual mode exhaust system the LS3 produces 436 horsepower and 428 lb-ft of torque). However the new LT1 which is lighter than the LS3, manages to be more powerful producing 450 horsepower and 450 lb-ft of torque. However with a little reduction in overall body weight of about 100 lbs when compared to the current Corvette, the net effect is a 3.8 second 0-60 mph time which easily beats the current LS3 powered 2013 Corvette which does the same run in 4.1 seconds. Here’s where it gets interesting, the 2014 Corvette’s 0-60 mph time is identical to the 505 horsepower LS7 (7.0 liter/427 CID) V8 powered 2013 Corvette Z06 and 2013 Corvette 427 Collector Edition. Even with the weight reduction of the 2014 Corvette there should be a performance gap between these LS7 powered Corvettes and the new LT1 powered Corvette. Either Chevrolet is fudging the 0-60 mph time or they are underrating the LT1’s horsepower. My guess would be the latter. However with the new LT1 matching the LS7’s performance, will more than likely put the nail in the LS7 coffin, Chevrolet more than likely won’t offer it in the new C7 especially since the LS7 is based on older engine architecture. However there are rumors it may see duty in an upcoming special edition Camaro. However for those future C7 buyers who currently own a LS7 Corvette that may think they will miss the torque from the mighty LS7, the LS7 which produces a mighty 470 lb-ft of torque is only 20 lb-ft more than the new LT1. This is mighty impressive since the 427 CID LS7 displaces a whopping 51 more cubic inches than the 376 CID LT1. The 100-lb weight reduction is big news, however it’s done with a much stronger and more rigid frame structure. Not only does this type of improvement allow the Corvette to take more punishment on rough roads than previous versions, handling will be greatly improved. The C7 now has a perfect 50/50 (50% front and 50% back) weight distribution. Not too long ago many would have thought that impossible for a front engined 2-seater sports car with a V8 engine to have this perfect weight distribution. When the C4 was released 30 years ago, it was hailed as being one of the best handling and well balance sports cars in the world – it had a 53% front and 47% rear weight distribution. Also helping weight reduction in the new C7 is a standard carbon fiber hood instead of fiberglass. There are three different suspensions to choose from with the new C7: base suspension and two different levels of the Z51 handling package. Handling will be better than ever, and the same will be true with braking. And when it comes to styling, Chevrolet engineers really out did themselves with the new C7. And this is no small triumph, after-all the Corvette is an American icon. Designers with the new C7 have had to walk a very think tight rope, by offering striking styling while also making sure to not to anger loyal Corvette buyers. Ever since the C4, Chevrolet has used the evolution approach which is what Porsche has done with its 911 for the last 50 years. It’s a safe approach, but Corvette styling has lost some of its curbside appeal in the last two decades. It’s not that the C5 and C6 weren’t attractive cars which they most certainly were, however when looking at the C5 and C6 you get the feeling that Chevrolet stylists didn’t work up to their full potential. With the C7, this all changes. Chevrolet went crazy and changed every body panel but every crease and curve is beautifully sculpted. At close inspection you can see the amount of detail and thought that went into the styling. Nothing looks out of place on this car, and it breaks new styling ground. You can tell the stylists gambled with the dice and it paid off. They also could have taken the easy route and gone retro (only the front lower big grille is semi-retro, since it looks like a modern version of the 1953-1960 Corvette’s grille), but they chose to move forward and one look at the Corvette and you will agree they made the smart choice. And even such items as an operational duct system and side rear windows were new territory for the Corvette, but they both add to the appeal of the package. The taillights were also a big departure from the past that add so much extra appeal to this car. This new C7 is a radical car, and it’s just the kick in the pants the Corvette needed however stylists managed to still make the car look recognizable as a Corvette to most onlookers. The styling is so chic, which is something missing from the Corvette since the radical styled C4 transformed the Corvette from a Disco era relic to a-way-ahead-of-its-time world class 2-seater sports car that was the envy of the world. What exactly does this mean? It’s simple, the Corvette will be the first car in three decades to get non-Corvette fans off the fence and into the Chevrolet dealership to sign on the dotted line to $700 or more a month car payments. And they won’t care about the pinch on the wallet, even when they write those wretched monthly checks, because this car is just that great. It’s worth every penny of the $50,000 base price – especially when you consider that for $50,000 you won’t find anything that looks this good, drives as fast, or handles as well for the money. Putting this another way, BMW (a company well known for capturing the top end of the performance market) will sell you its lowest price 2-seater sports car, the 2013 BMW Z4 sDrive28i for for a base price of $47,350. This includes average styling, a 240 horsepower 2.0 liter 4-cylinder, and average handling for a sports car. Never fear for $55,000 BMW throws in a 300 horsepower 3.0 liter 6-cylinder and for a base price of $64,200 a 335 horsepower turbo 3.0 liter 6-cylinder is standard. And even though there are many loyal BMW buyers, it’s a safe bet some of these folks will be moving over to the Corvette camp since $50,000 buys them so much more, that even the allure of the cherished BMW emblem can’t stop the exodus. The introduction of the 1984 C4 saw the best Corvette model year sales of 51,547 units – part of the success was the extended sales year (due to a March 1983 release) but a big part was also the car attracted buyers from across the spectrum. 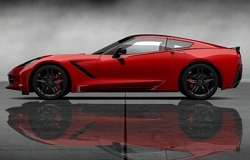 The new C7 has that same appeal, and with a late Spring 2013 release it too will have an extended model year – so it is entirely possible the 1984 Corvette’s sale record may be broken by this first year C7. And that’s good news considering the C6’s sales in the last few model years have been disappointing. There’s no doubt the leap forward from the C6 to the C7 feels like 20 years into the future. Nowhere is this more apparent than in the interior. Where the old interior was sufficient, it wasn’t up to par with a world class sports car. Now with the new shape, feel, and the materials used in the interior; finally the interior is on par with some of the best 2-seater sports cars of the world. And since 1984, the Corvette continues the tradition of having the most state-of-the-art gauges and visuals you will find in a dash layout. 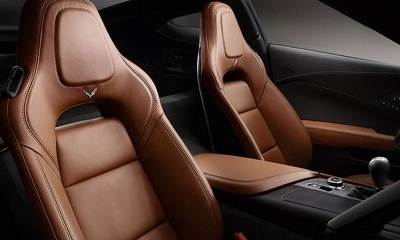 The new seats which are offered in rich Napa leather in a array of different colors are what the Corvette has needed for many years. 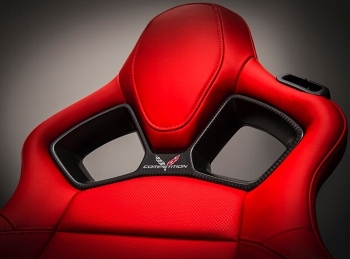 The standard seat is called the Grand Touring Seat which provides excellent support all around. However Chevrolet went one step further by offering the Competition Support Seat (also in Napa leather) – it provides even better support for on-track use than the standard seat and even has cutouts in the back of the seat for those who want to install a 5-point racing style seat belt harness. 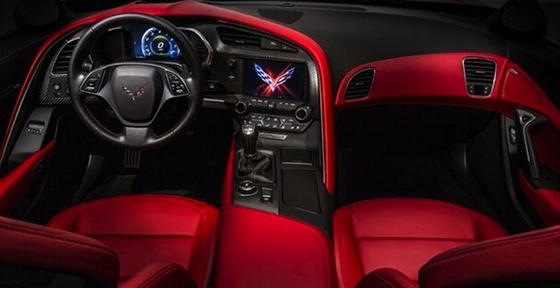 Even if you ignore the high tech gadgetry and all the new niceties on this new Corvette – the C7 is the real deal. Chevrolet ought to be commended for their effort on making such a fine car and for bucking the politically correct attitude of most automakers who are running in retreat for the hills due to CAFE. In fact they have done such a great job of bucking this trend, Chevrolet ought to be rewarded by you with a purchase of a new Corvette. However who are we fooling? Anyone who rewards Chevrolet will receive a lot more in return – this buyer will have one of the fastest and best handling 2-seater sports cars on the road (not to mention one of the best looking). With the new 2014 Corvette the spirit of the wild 1970s Trans Am is back from the dead and tearing up the streets without a care in the world. I wonder what’s next? Will Disco music return or will mustaches make a comeback? Never underestimate how history continues to repeat itself – and in the Corvette’s case let us hope history keeps repeating itself for many years to come.